View of Loweswater from the east with Dub Beck inflow at top and outflow at bottom. 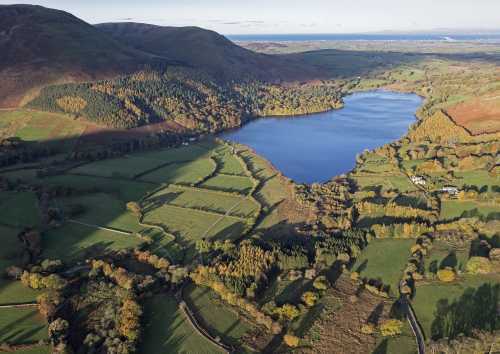 The Loweswater Care Programme (LCP) focuses on work being done on the lake to improve its water quality through gaining a better understanding of catchment processes and applying targeted interventions to this end. This work was started by local farmers in 2002 and has continued in various forms since that time. This work is described in more detail under the various headings in the LCP history side-panel. A key event was the LCP becoming part of West Cumbria Rivers Trust in 2012 in order to undertake the Defra-funded 3-year Catchment Restoration Fund (CRF) project “Improving water quality in Loweswater”. The main issue being tackled in this work is excessive growth of algae, notably of the so-called blue-green algae (more accurately termed cyanobacteria) which can be toxic. This is not an uncommon problem in many lakes throughout the world. The extent of algal growth is most commonly determined by the level of bio-available phosphorus compounds, notably phosphates.In addition to possible toxicity and aesthetic impacts, algal growth leads to eventual deposition of organic matter on the lake bed. For lakes like Loweswater that stratify for several months in the summer, this deposition on the lake bed leads to oxygen depletion through bacterial activity and sometimes to the undesirable re-dissolution of the algal phosphorus. With the completion of the CRF project in 2015, we have made improvements at a number of farms in the lake catchment, which should, over time, result in reduced loading of phosphorus compounds on the lake. We are continuing to monitor the catchment through monthly sampling and analysis of the lake’s feeder streams and continuous monitoring of the lake itself – the annual reports of this monitoring are available on the LCP Reports page. We have no definite plans at present for further improvements at farms in the lake catchment, but we do have an outline concept to re-naturalise the course of the main Dub Beck feeder stream to trap particulate phosphorus and thus prevent it reaching the lake.